to what you thought these Mini Neon Sour Gummy Worms might be. But rest assured, these little wrigglers are so yummy. In a rainbow of colors, these colorful mini worms are packed with fruity flavor and a burst of sour sugar flavor that will make you pucker. Make your next Halloween bash even creepier with these night crawlers. You can set them out in a dish, add them to the top of a special Halloween cake, or just munch on them to gross out your little ones. 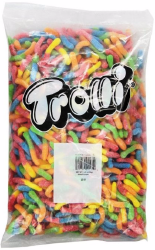 Bag contains 5 pounds of Neon Sour Worm Candy.